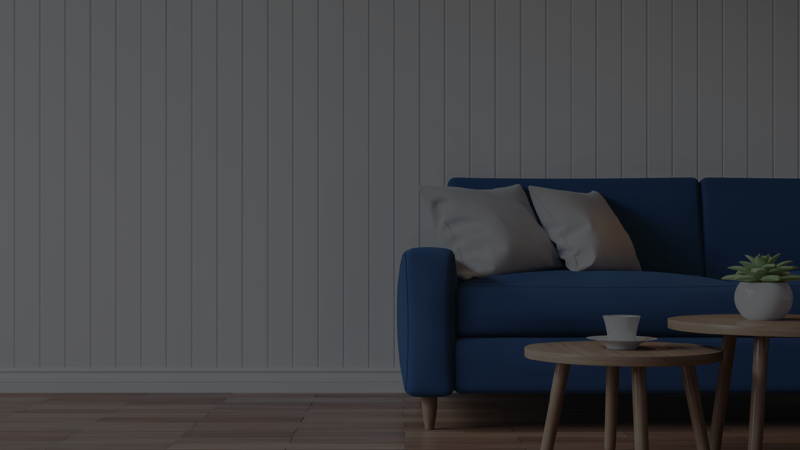 Whether you’re looking for an airy studio apartment or a cozy one bedroom to call your own, we have the adult and senior living apartment option at the affordable price that’s perfect for you. Our apartments accommodate one or two residents comfortably and come in two carefully designed floor plans, specifically for the lifestyle needs of active adults and seniors. 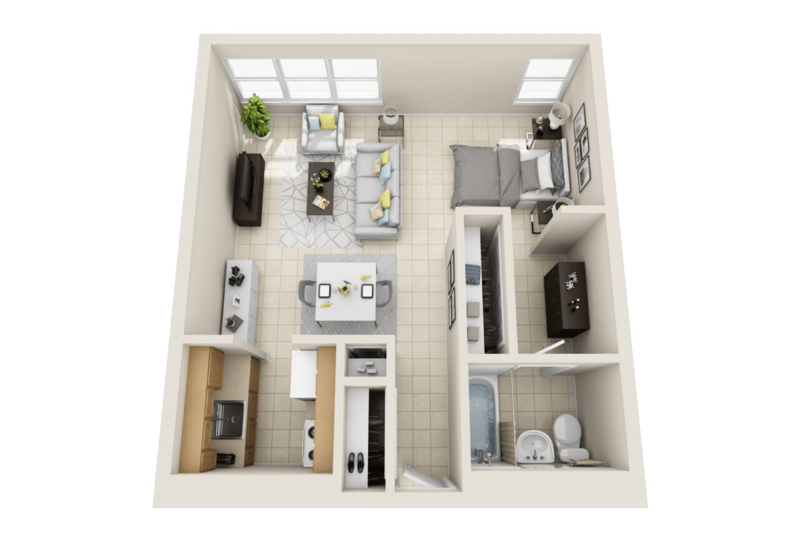 Floor Plan A: One Bedroom Layout | 584 sq. 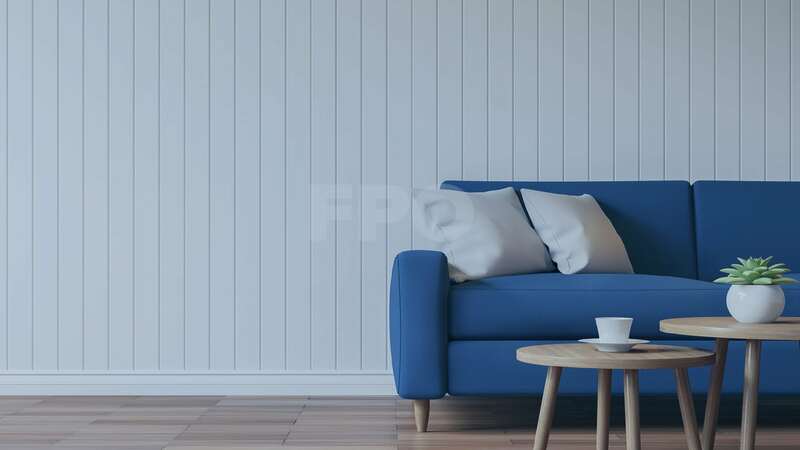 ft.
Keyport Leisure Bay Apartment’s one-bedroom apartment layout puts you at the height of comfort, nestled away in a more traditional, private apartment style to give you the flexibility to live a care-free lifestyle. In addition to the spacious kitchen, bathroom and living space, the bedroom features large windows that flood the room with natural light. 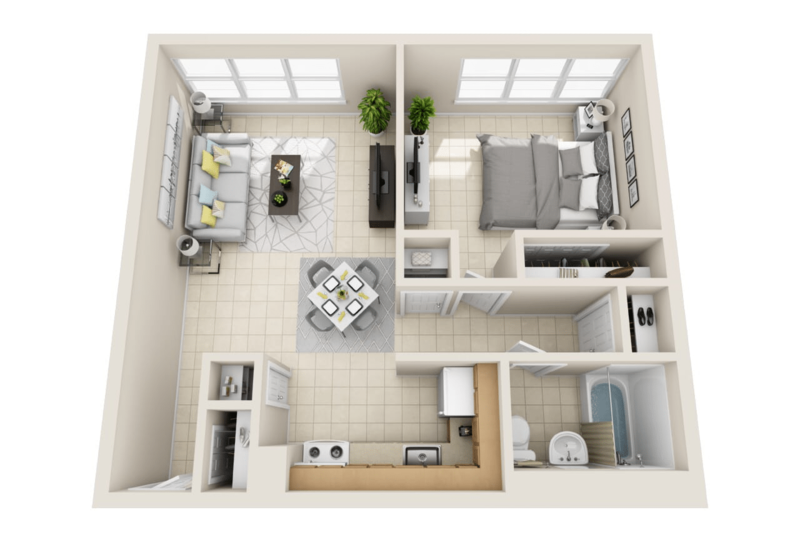 Floor Plan B: One Bedroom Layout | 584 sq. ft. While the same square footage as Floor Plan A, this spacious one-bedroom apartment is the perfect option for those seeking an open, airy feel. The tall, insulated windows featured in the living area and bedroom flood the apartment with natural light. In addition to the spacious living room, this apartment provides a extra space in the kitchen and bathroom, making it easier to maneuver wheelchairs or walkers. This private, traditional apartment style gives you the space and flexibility to live the care-free lifestyle you want here in the heart of Keyport. 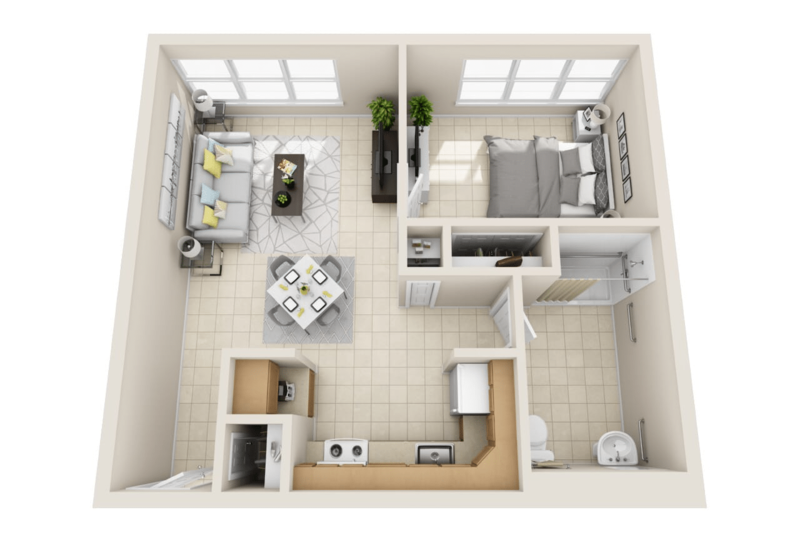 Floor Plan: Studio Layout | 484 sq. ft. Spread out in this non-traditional layout, with living space flowing from room to room without walls to separate each area. If you like a more contemporary design, our open, studio-style apartment fits your tastes perfectly! This floor plan features an open-plan, uninterrupted living room, bedroom and kitchen area with a closed-in, walk-through closet and bathroom for just the right amount of privacy. Experience the Comfort of Keyport for Yourself.